Painful puppy teething, 5 photos of faulty tooth alignment (bad bite), when and why to pull crooked teeth or retained baby teeth to prevent misaligned jaws in toy breed puppies. Crooked or retained baby teeth is a common problem in Toy breed puppies so cutting teeth is a critical step in your puppy's dental health. 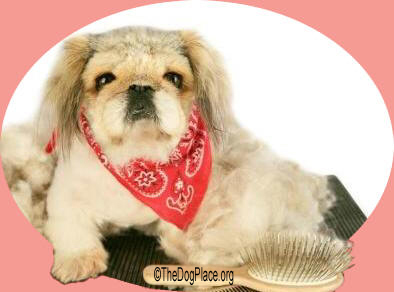 Toy Breed puppies need special attention due to overall miniaturization, particularly the jaw bone. Toy breeds often have misaligned or retained baby teeth. Poor dentition leads to chronic gum infection which can actually cause heart problems. Toy breed teeth and dental care are not the same as the larger dog breeds. 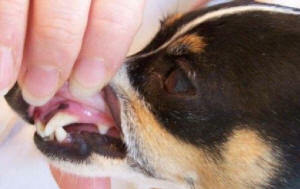 Toy breeds do not always loose their baby teeth so those tiny teeth need to be pulled at the appropriate time. Experience has taught me that few vets are knowledgeable about canine dentistry. When this was first written in 2006, there were only 6 board certified in canine dentistry in the U.S.
Basically, toy breeds' lower jaw grows faster than the upper jaw. This causes the bite to go undershot (the lower teeth protrude beyond the upper teeth – a reverse scissor bite or worse). A scissor bite is a “man-made” bite and the even bite is a natural bite. So according to one of the six board certified vets in canine dentistry, we have created our own problems with bites/teeth. 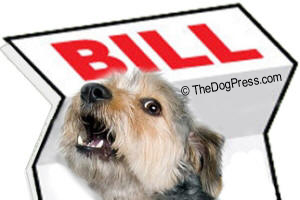 If a bite on a 12 week old puppy seems to be going off – (1) undershot; (2) overshot; or wry mouth, the appropriate teeth need to be removed – either upper and lower jaw or the teeth in the jaw that are binding. If the bite is undershot, then remove the upper jaw teeth; if the bite is overshot, remove the lower jaw teeth; if the bite is wry*, the canines should be removed because they are locking in place the way the teeth are coming in. Removing those baby teeth allows the adult set to come down into place like they should. 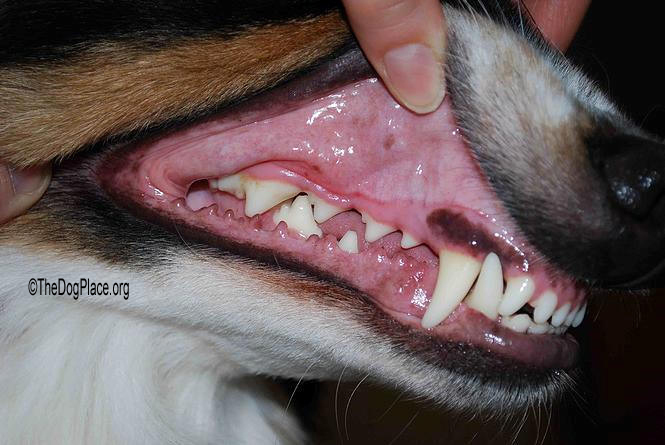 Because toy breeds seem to have those baby teeth anchored in so tight, they often mess up a bite severely. Baby teeth can make adult teeth come out, making the teeth more forward (almost horizontal**) rather than straight up and down (vertical) and can cause the permanent adult teeth to appear inside the parameters of the teeth line (almost roof of the mouth). Extract the appropriate teeth of a questionable bite at 10 to 12 weeks of age. Remove the baby teeth as soon as you see a bite starting to go off and certainly all baby teeth should be out by 6 months of age. 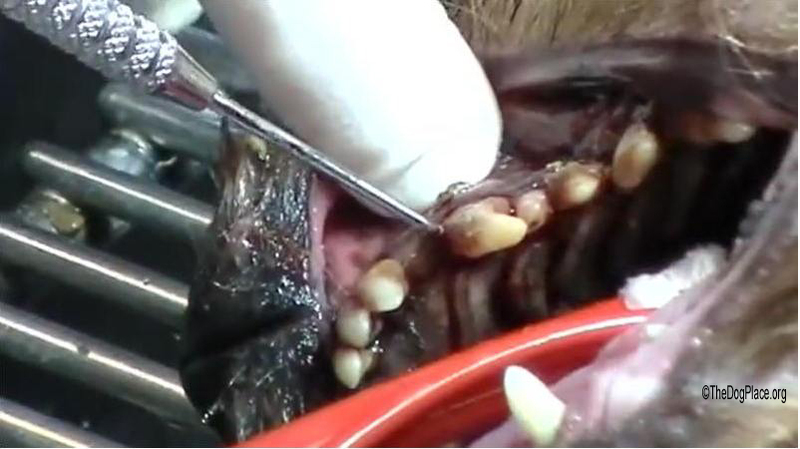 The canine teeth don’t normally come out till the dog is 9 months of age but if the bite looks like it is off, the proper jaw’s canines should be removed. Also remember that if you do not remove baby teeth, the bite could go undershot since the lower jaw naturally grows faster than the upper jaw – sometimes it takes up to a year and sometimes a year and a half to correct on it’s own. If the dog is a valuable show dog, you run a risk of a messed up bite if you do nothing or your vet doesn’t know what to do or advises you to just watch the bite. It is safer to pull the teeth at the appropriate times. A vet using isoflorine is best and no other medication, and one that can keep small kittens alive during surgery is what you need to find to do your dental work on toy breeds. If a vet says he/she is an expert on canine dentistry, ask to see board certification for having received education in this specific field and check to see if that expertise also includes experience with toy breeds. *If the bite is a wry mouth, that is considered a “severe” problem and all the baby teeth on that side need to be pulled – even the back teeth. In slight under or over bites, remove only the front teeth and certainly remove the baby canines if they are binding any incorrect bite because they don’t normally come out on their own (if they come out at all) till 9 months of age. If the over or under bite is severe (quite a wide gap), then remove all the teeth in the appropriate jaw. **If the bite is almost horizontal or “parrot bite,” you may have a depletion (leeching) of the calcium from the bones (particularly noticeable in the extremities and teeth) going on in your puppy. Feeding a balance (I stress BALANCE) of calcium/phosphorus and getting the baby teeth out (all of them because this is a severe condition) will correct that bite if the dog had a correct bite at 8 weeks (young puppy). I give OsteoForm from ages 3 - 4 months to 9 months or longer and it is especially necessary in puppies who have big growth spurts. I pass this information on as what I have learned the hard way and it has taken me years to learn it through trial and error (way too many errors) so that you will not have to learn the hard way as I have and you will save many wonderful puppies that would have been lost as stars in the show ring. Prevent tooth loss and infection which causes heart problems.